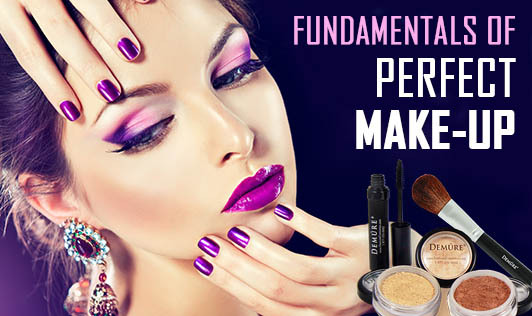 Certain fundamental principles must be followed, if you want to excel in the art of applying make-up. Here are a few pointers to keep in mind before you apply make-up. 1. Lighting must be effective, without throwing in shadows on the face. While applying day make-up, sit with your back to the window. 2. Your make-up necessities require you to be the best judge. Decide your make-up requirements bearing in mind the type of skin, complexion, and the nature of your vocation. 3. Always buy cosmetic items from a reputed company/brand. 4. Your requirements should not only include cosmetics, but also items such as absorbent cotton pads, cotton buds (Q-tips), and wet and dry tissues. 5. The shade of foundation you choose must match the darkest part of your face. There is a tendency for women to buy a lighter shade thinking it will make them look a shade fairer. 6. An oily skin requires a foundation with a water base. An oil-based foundation is ideal for dry, normal skin, and combination skin. 7. Never test the shade or color of make-up on your wrist. Dot your forehead with the different shades of foundation and pick the one closest to your skin tone. 8. Never test colors in artificial light. 9. Always use the right accessories while making up your face. 10. Never use foundation over stale make-up. Every step while applying make-up must merge with the previous one and blend evenly with the other.